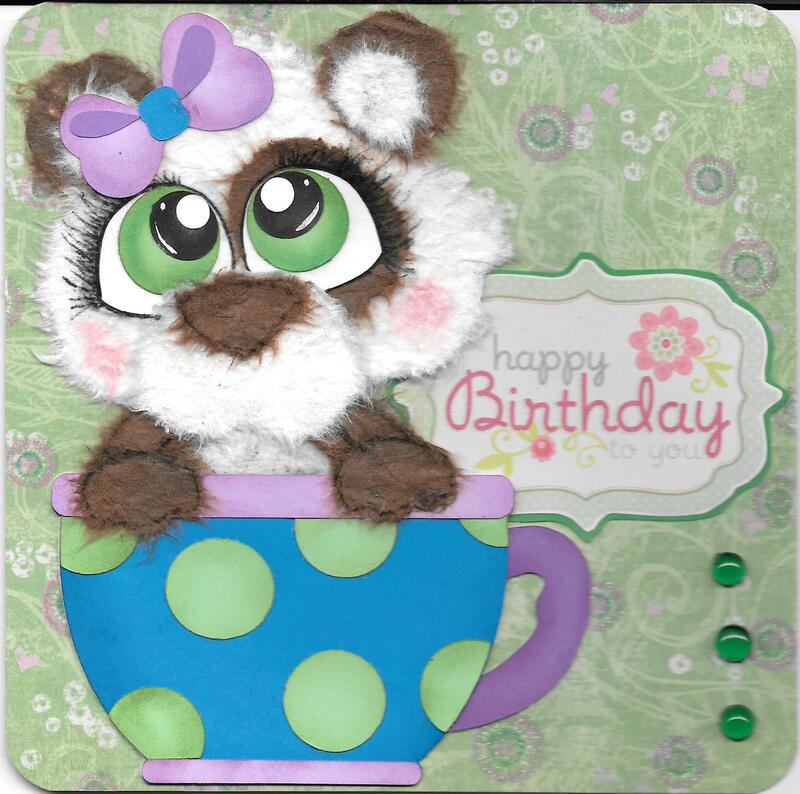 Like to share the tear bear I made using Teacup Panda from Kadoodle Bug Designs. (Cutie KaToodles – Teacup Panda). My second attempt at tear bears. Lots of work, but I’m loving it. Outlined paws with Spectrum Noir Marker. Eyes with Pigma Micron 05 marker. Patterned paper – Kaitlin – Recollections Signature 12 x 12 Paper Pad. 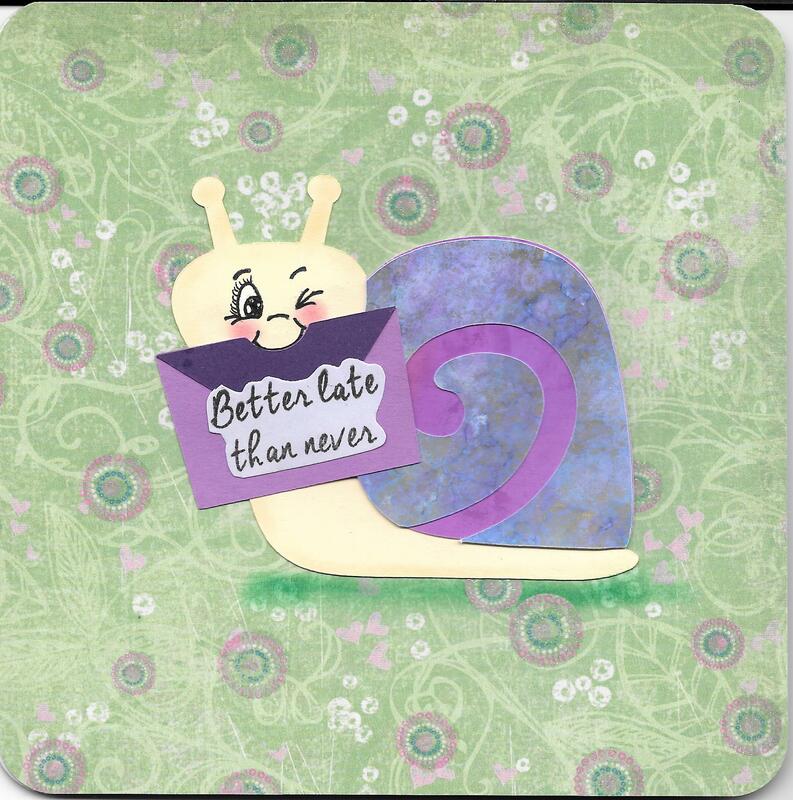 For the inside, I cut out the snail from Cricut Cartridge Birthday Bash. 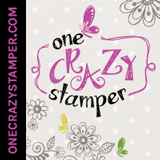 Then I stamped the face with Peachy Keen Stamp Set – PK490 – Everyday Character Face Assortment. I added in some extra eyelashes and used my White Gel pen on the eye. Used chalk for cheeks, outline of snail and for shadow below snail. For the shell, I used some paper that I made using the Tim Holz Ranger Alcohol Inks. 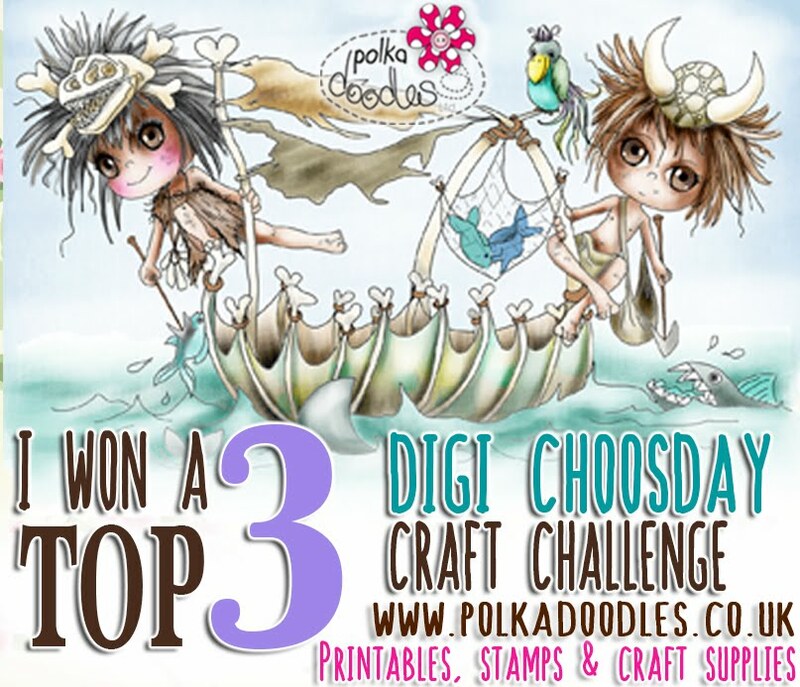 Sentiment is from Craftin Desert Divas Stamp – Just because. (Cutie KaToodles – Teacup Panda). 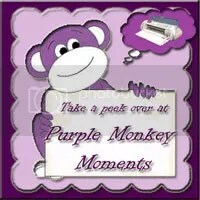 Just Because stamps can be found here: http://www.craftindesertdivasshop.com. for my brother’s birthday with you. Border – Peachy Keen Stamps PK-1425 Birch Frame Background A2. 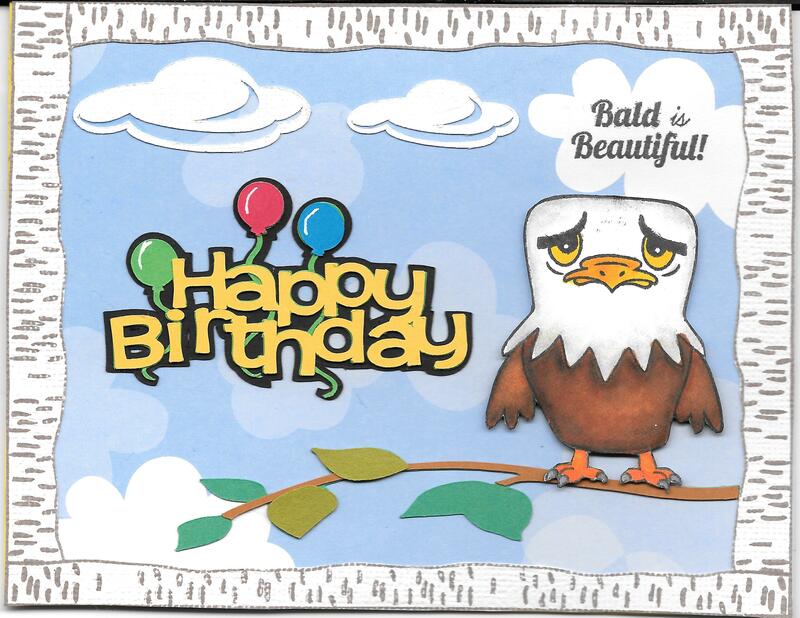 Eagles and Sentiments – PK-1427 Smile Eagle . Stamped with Memento – Tuxedo Black Ink. 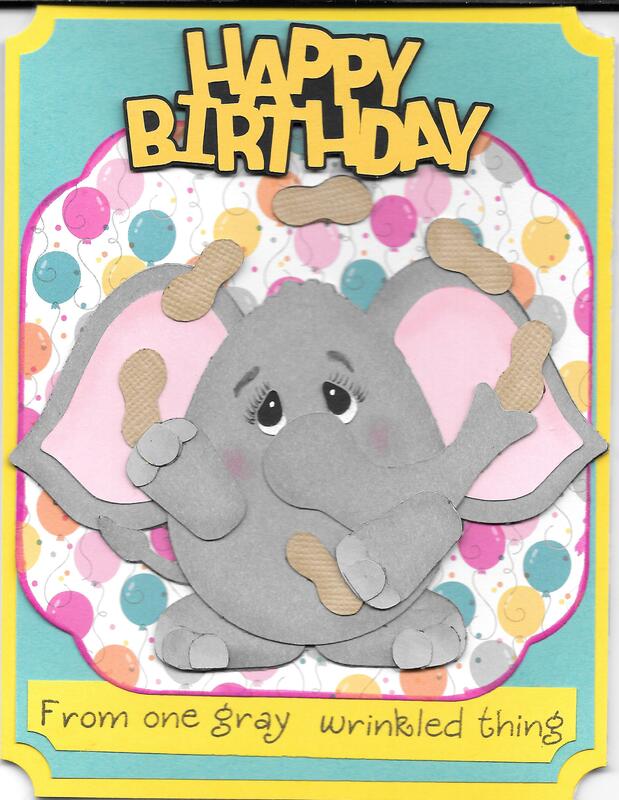 Here is a card that I made from a freebie from Kadoodle Bug Designs from the Eggie Buddies collection called EggieBuddiesElephant. I used Quickutz Nesting Frame 7 from We R Memory Keeperts and my Cuttlebug to cut out the shaped background from Doodlebug Design Inc. 6×6 paper pad, Sugar Shoppe double-sided cardstock collection. Then used a marker to go around the edging. Layered it onto blue and yellow cardstock. 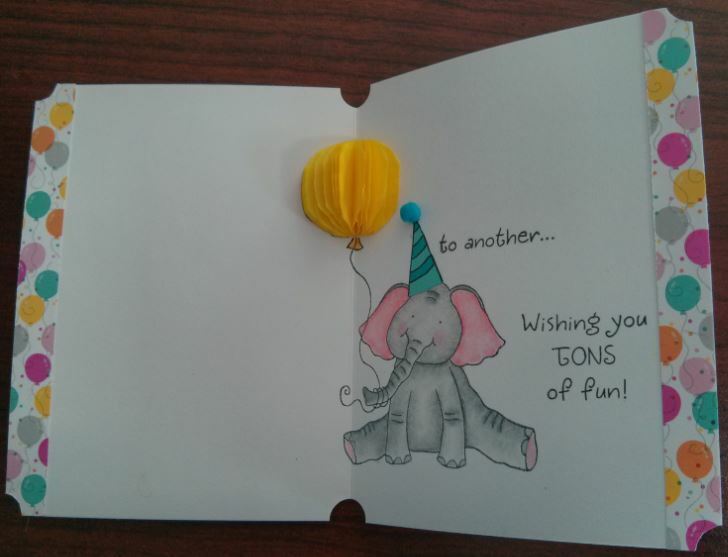 Happy Birthday was cut out on my Cricut Explore and sentiment is from Inky Antics Clear Stamps Birthday Elephant. 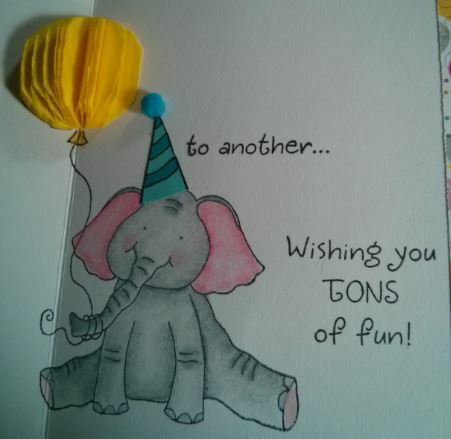 Inside is from Inky Antics Clear Stamps Birthday Elephant. Balloon was made from Inky Antics Honeycomb Paper Assortment – Yellow. Elephant and Sentiment was stamped with Memento – Tuxedo Black ink and then was coloured in using Copic Cool Grey for the base and then highlighted with PrismaColor Premier Pencils and Gamsol using pencil stumps. 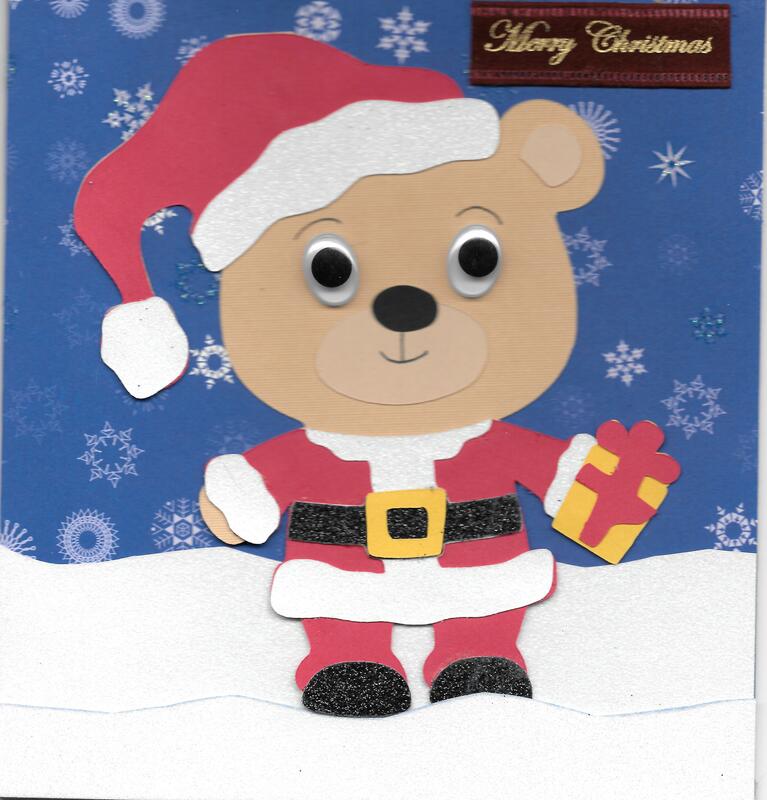 To make this card, I used the bear from Cricut Teddy Bear Parade and my Gypsy to cut out the pieces using various cardstock (Red, gold, beige, tan, glitter white and glitter black). 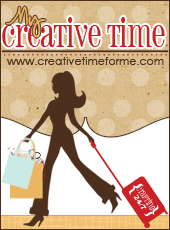 Snow background is made with Glitter Paper from “The Paper Studio Christmas Cardstock Pack”. Then I used some ribbon for the sentiment. 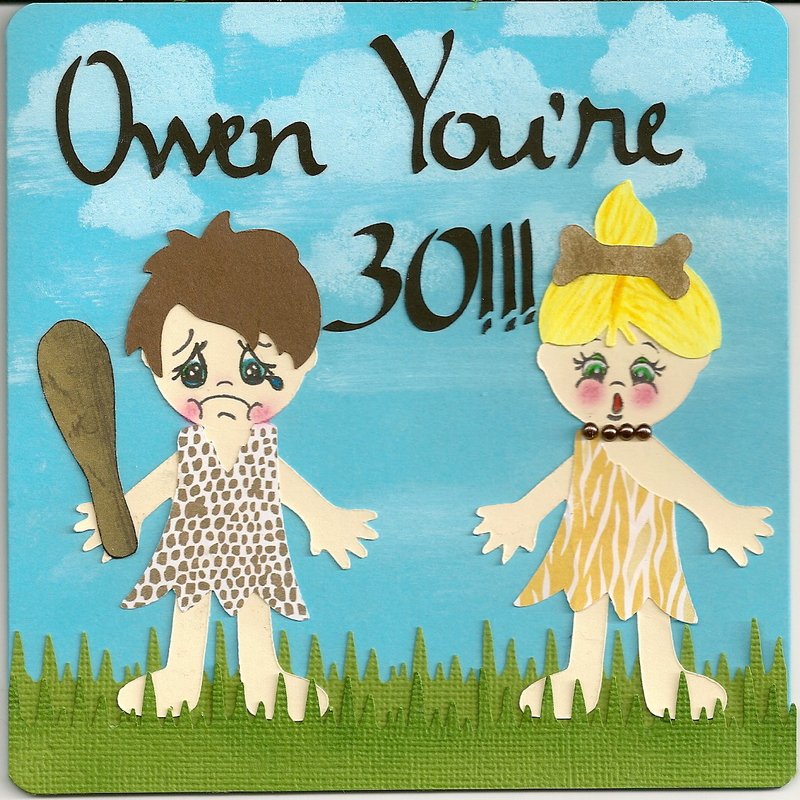 My nephew turned 30 this year, so I thought I’d make him a heartfelt card to tease him about getting a year older. 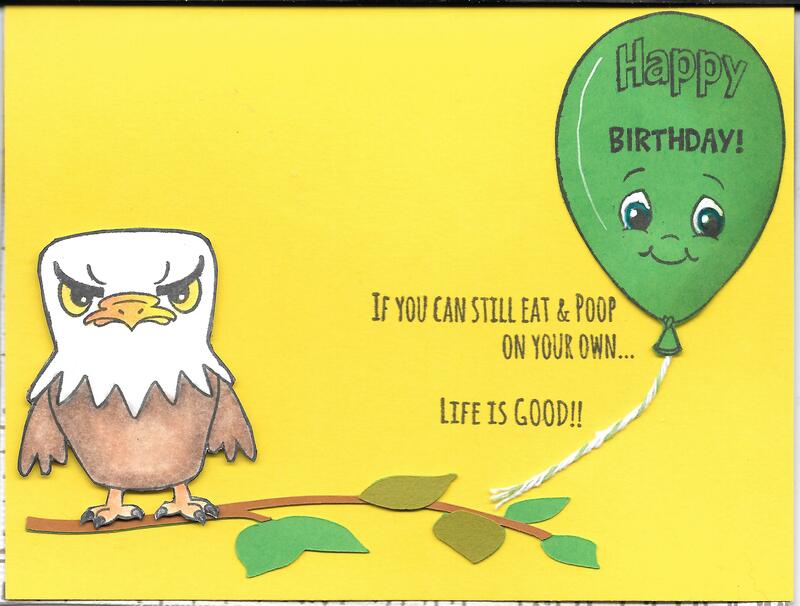 To make the card, I used blue cardstock, green cardstock cut with Martha Stewart Icicle punch, black cardstock for wording, DCWV Animal Prints, scraps of yellow, brown, flesh coloured cardstock, Spectrum Markers and PrismaColor Premier Pencils with Blending Solution. Rounded corner punch. The boy and girl were both cut with my Cricut using Paper Doll Dressup. 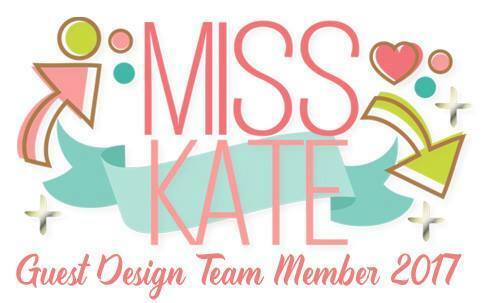 3″ x 2.25″, accessories to match. 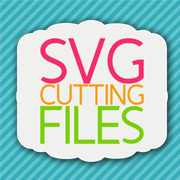 Wording – Jasmine Font. I used pink chalk for their cheeks, blue and green marker for their eyes and Inkssentials for their eyes. Bronze pearls for the girl’s necklace. 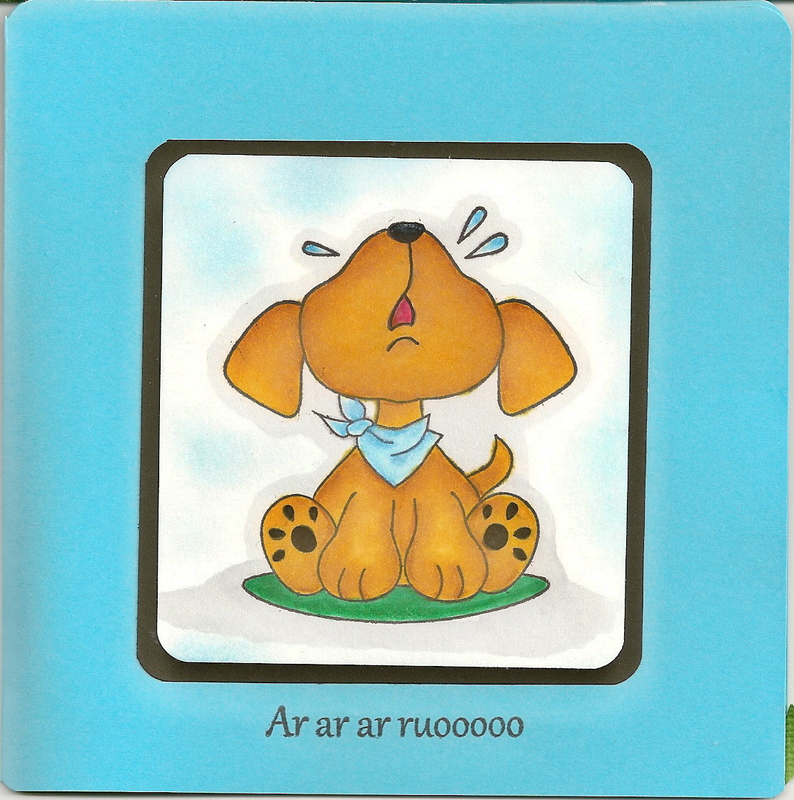 For the inside I stamped the little dog and sentiment with Tuxedo Black Memento Ink using PK-1334 Howling Puppy stamps. I then coloured it with Spectrum GB3 and then used Prisma Coloured Pencils PC943 and PC945 for shading. Kerchief – Spectrum IBI, Prisma Coloured Pencils PC902, PC903, PC904 for shading. Mouth – Copic R37, R39. Rug – Spectrum GT2 ad GT3. Lastly, I put a shadow around the whole puppy with Spectrum IG1.